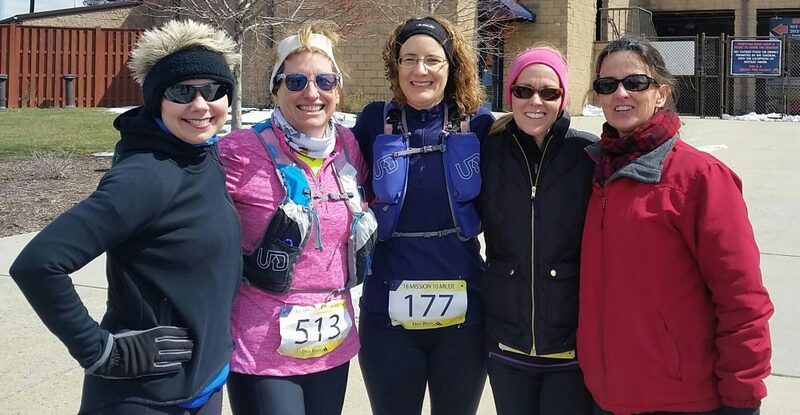 When the 2017 Women’s 5K Training Program ended, many participants wondered, “What will we do now?” Thanks to Jolene Haile-Miller, weekly off-season runs continued. Maxann Davis, Brigitte Farrell, Katie Marple, Melissa Sites and Caree Vander Linden joined these runs and started increasing their mileage. They started talking about half marathons during a run in late 2017 and decided to register for the Frederick Half. Maxann joined the Steeplechasers after Lou King posted a link about the Women’s Distance Running Festival on their neighborhood Facebook page. Previous attempts at training on her own were unsuccessful. Brigitte ran the Frederick Half in 2017 but didn’t train consistently. After meeting the other ladies in the 5K training, and running with them in the fall, Brigitte decided to sign up for the Half Marathon Training Program. Katie signed up for the 5K training program to increase the distance she could run at one time. She didn’t attend many of the group runs but started meeting with the other ladies after the training program ended. Melissa started running in 2011 on her own, mainly to maintain her weight. She ran in several races before someone suggested that she join the Steeplechasers. She participated in the Women’s 5K Training Program in 2016 and 2017. Caree joined the Steeplechasers in 2016 to participate in the Women’s 5K Training Program. She wasn’t sure she could even run a mile, however, after running the Women’s Distance 5K, she went on to run three more 5Ks. Unable to run the Frederick Half, she registered for the training program to prepare for her goal race, the Mission 10 Miler. Because they kept up with their mileage during the off-season, they were prepared once the training program started. All the ladies had signed up for the Mission 10 Miler, but Katie, Maxann, and Melissa also ran the MD RRCA Club Challenge, and the Forest of Needwood 5-Mile Race. An injury prior to the Mission 10 Miler sidelined Melissa, but she cheered everyone else on as they ran. As the weeks went by and the mileage increased, the ladies discovered that half marathon training is more than longer runs. Training in the winter meant sub-freezing temperatures, as well as cold weather running gear. Longer runs also meant experimenting with hydration and fueling. Although they weren’t always able to make it to the group runs, they held each other accountable by meeting on different days or at different times. As race day approached, Katie and Maxann felt ready. Unfortunately, due to earlier injuries, Melissa and Brigitte were unable to run, but they gladly cheered on their fellow runners. Both Katie and Maxann had great races, thankful for the training program and the encouragement of their running buddies. What’s next for these ladies? In addition to the Women’s 5K Training Program and Women’s Distance 5K, they plan on running more of the Steeplechasers Signature races, more 10-mile races, as well as checking out some trail runs.